I work on almost any plant that isn't grown for food or fiber. Much of my job involves assisting landscape professionals and pest control professionals manage pests and diseases in an environmentally sustainable manner. 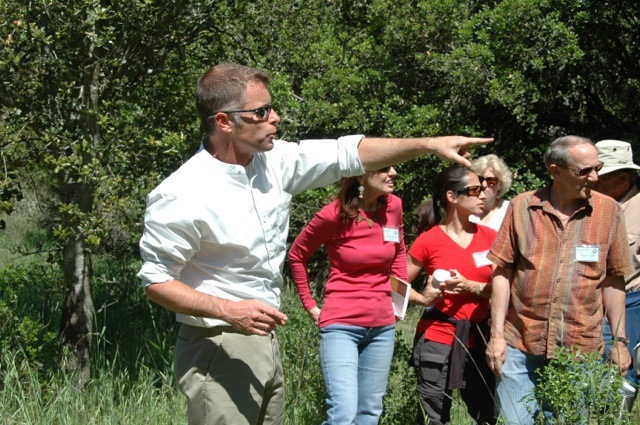 I also work with small parcel forestland owners to help them manage their land in ways that help keep forests healthy and fire-safe, and work on water quality and water conservation issues. The satisfaction of helping people deal with pests in a way that makes everyone happy. I was working for a tree company in the Santa Cruz area, doing arborist's reports, estimating, and consulting. I occasionally ran across diseases or other problems that I was unable to properly diagnose. I turned to UCCE Santa Cruz Advisor Steve Tjosvold for help, and was amazed to discover that someone actually got paid to do plant disease diagnosis work. I was inspired to go to graduate school to try and get better at my job, but never quite made it back to industry (though I really enjoy working with industry).